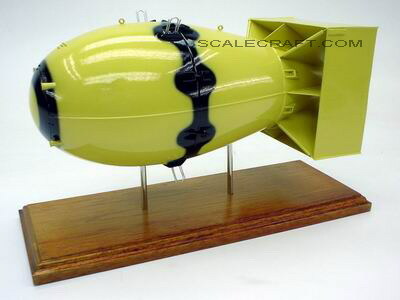 Fat Man was the second nuclear weapon used in warfare. Dropped on Nagasaki, Japan, on August 9, 1945, Fat Man devastated more than two square miles of the city and caused approximately 45,000 immediate deaths. Major Charles W. Sweeney piloted the B-29, #77 that dropped Fat Man. After the nuclear mission, #77 was christened Bockscar after its regular Command Pilot, Fred Bock. While Little Boy was a uranium gun-type device, Fat Man was a more complicated and powerful plutonium implosion weapon that exploded with a force equal to 20 kilotons of TNT. Mahogany Wood. Scale: 1/10. Length 12 inches.